The HP BladeSystem c7000 enclosure with BL460c G7 blade servers is an excellent fit for performance demanding applications as well as scale out virtualization. Aventis Systems offers the BLc7000 with BL460c G8 in fully or half populated configurations with choices of 16 or 8 server blades.HP's BladeSystem c-Class c7000 Enclosure is a 10U enclosure with shared infrastructure including redundant power supplies, up to six hot plug, a three phase or single phase power input modules, up to ten hot-plug, redundant Active Cool 200 fans, and an optional redundant BladeSystem Onboard Administrator module, and up to four redundant interconnect I/O fabrics (Ethernet, Fibre Channel, InfiniBand, iSCSI, SAS, etc.) are supported simultaneously within the enclosure via up to eight interconnect modules. The HP ProLiant BL460c G7 server blade is a dual-socket, half-height system powered by Intel Xeon 5500 or 5600 Series processors for up to 6 cores and 30MB cache per CPU. Twelve dual in-line memory module (DIMM) slots supports up to 384GB DDR3 memory operating at a maximum speed of 1333MHz. Two 2.5" hot-plug hard drive bays support 6Gb/s SAS or SATA hard drives, as well as solid state drives. The BL460c G7 features the integrated NC553i Dual Port FlexFabric 10Gb adapter supporting autosensing 10Gb/1Gb Ethernet, FCoE, Flex-10, TCP/IP offload engine, hardware-based accelerated iSCSI, and iSCSI boot. 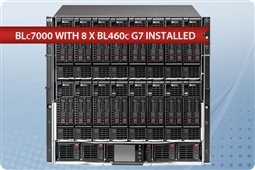 Aventis Systems carries Aventis Certified Reconditioned HP BladeSystem BLc7000 with BL460c G7 Server Blades. All servers from Aventis System include a 3 year Comprehensive Warranty, with eligibility for optional Express, Extended, and Secure Drive Warranty Upgrades as well as Onsite Services. Please browse our BLc7000 with BL460c G7 blade server solutions below for the perfect customized server solution for your virtualization requirements today! 1TB (2 x 500GB) 7.2K 6Gb/s SATA 2.5"